Flash floods in rivers and nullahs in Madhya Pradesh, caused by heavy rains since the past three days, have left at least 11 people dead and around 200 villages marooned. The Army, which was pressed into rescue operations in Satna district, evacuated around 400 deluge-hit people to safety, reports reaching the state revenue control room here said on Saturday. Chief minister Shivraj Singh Chouhan called an emergency official meeting here in the afternoon to take stock of the situation. "Eight people died in rain related incidents in different parts of the state in the last three days," Mr Chouhan told reporters after the meeting. While two deaths have been reported in Bhopal district, one death each has been reported in the districts of Tikamgarh, Rewa, Jhabua, Betul, Raisen and Panna. Earlier, one person was washed away in the swollen Shahpur lake in Bhopal. Similarly, two others were washed away in the flooded nullahs in Mandla and Singrauli districts. 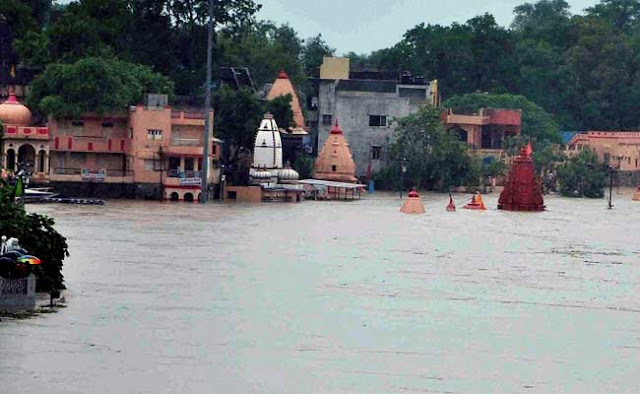 "Satna district has been affected the worst by the flash floods. Water levels in all the rivers in the district are on the rise. At least 200 villages have been marooned in the district. Around 400 people have so far been affected from the marooned areas by the army. As many as 23 districts in the state have been affected, either partially or fully, by the flash floods in the rivers in the areas. The flood situation may not improve in the coming two days since the Meteorological Office has predicted heavy rainfall till July 11 in different parts of the state," a senior officer, deployed in the Revenue Control Room said. This is all so devistatingly sad. Undoubtedly climate engineering-the fools tinkering with our atmosphere- has much to do with all of this destruction and mayhem. I sincerely hope they are stopped and brought to justice for their evil deeds.